How can I Create Invoices and make payments at a same time in bulk? This feature helps you to generate Invoices of the confirmed orders and make the payment at the same time. You can do this for multiple orders. This also facilitates to push the Invoice generated directly to the Accounting Channel (if you’ve integrated with Orderhive) and the Payment will be reflected as well. Once the orders are reflected in Orderhive, you need to confirm or approve the orders before generating invoices. After successful confirmation of orders, go to Orders domain, select All Orders tab. 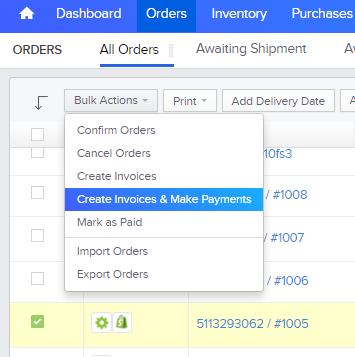 Select multiple orders from the order listing page and click in Create Invoices & Make Payments option from the Bulk Actions dropdown. You can even Create Invoices & Make Payments from tabs→ Awaiting Approval, Awaiting Payment, Awaiting Shipment by selecting multiple orders and click on Create Invoices & Make Payments option from the Bulk Actions dropdown. On clicking Create Invoices, you will get options of different templates for your selected orders. You can preview these templates using “View” while use the same using “Use This” option. The Invoice would be downloaded in the desired format. Doing this will highlight the Invoice tab when you select an order. Also since you are making payment simultaneously, the payment tab will show the payment done. Read this to see how accounting integrations work in Orderhive.